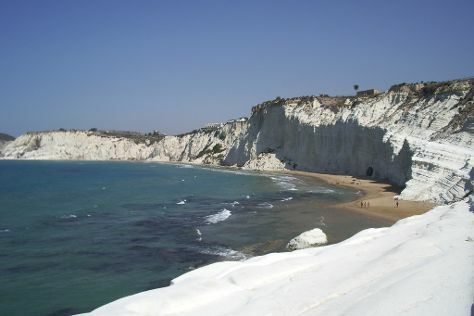 On the 18th (Thu), explore the striking landscape at Scala dei Turchi, ponder the world of politics at Palazzo di Citta, make a trip to Statua del Commissario Montalbano, then look for all kinds of wild species at Riserva Naturale Orientata Torre Salsa, and finally step into the grandiose world of Castello Chiaramonte. For traveler tips, where to stay, other places to visit, and tourist information, use the Realmonte vacation planner . In April, daily temperatures in Realmonte can reach 23°C, while at night they dip to 15°C. Finish your sightseeing early on the 18th (Thu) to allow enough time to travel back home.